YAY! You're back! We missed your posts! 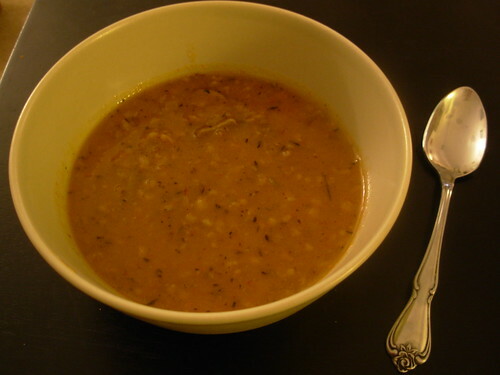 I made this soup last night (opted for the easy route), and it is absolutely amazing! Thanks for posting. i cooked up the spinach,egg and coconut scramble today - so tasty, so green, so simple. what a great website btw. thank you. only a few blogs i look out for and yours is one of them. glad to see you are back. thanks for the recipes and great pics. I made this soup the easy way using canned pumpkin. I also used canned mushrooms. I work at night so I popped everything into the crockpot before going to bed for the day and when I got up it was ready for my breakfast/supper. My family loved it! I am gradually moving them and myself to a more and more primal way of eating. The best thing is, my mother and myself are losing weight and my younger sibs who have a tendancy towards being rather skeletal are putting on muscle and growing! Thanks so much for your recipes and your insights. Always look forward to your new posts, please keep it up! Thanks! I'm glad the canned pumpkin version of the soup has worked out well for those who tried it, too. Had to use canned Pumpkin...there were no pumpkins left at the market. Accidentally used Turmeric instead of Paprika...made for one spicy soup...great recipe! Next time I use Paprika! (or add shrimp to the turmeric version - thinking about doing it leftovers for lunch tomorrow) Thanks for your blog! I made this soup the other day, and my boyfriend, who doesn't like soup or most vegetables, loved it. I was amazed. I am slowly switching them and myself to some additional and additional primal method of eating. I have a very happy family after tonight's dinner! My 4 & 6-year-olds couldn't get enough. Will definitely double, or triple, next time so we have more throughout the week... Thank you! This soup is absolutely amazing. I talked my picky eater son into tasting a spoonful, and he gobbled up the whole bowl. BTW I also added in some spinach at the very end. Don't know if that affects the paleo aspect or not (I don't really follow paleo, just stumbled on this recipe)....Thanks.